The invention relates to vinyl acetate-ethylene-copolymer dispersions suitable in particular for treating textile web materials, and to textile web material treated therewith, being suitable in particular as floor coverings or as belts. The vinyl acetate-ethylene-copolymer dispersions are characterized by a low ethylene unit content, relatively high glass transition temperatures, and a small particle size. The present invention relates to vinyl acetate-ethylene dispersion ( "VAE dispersions), which are particularly suitable for the treatment of textile fabrics as well as the thus treated textile fabrics, which are particularly useful as flooring or as straps. forming tread surface and determines the other hand, the walking comfort significantly. Binder were for stabilizing the textile surfaces or for laminating verschiedenster layers in the past been used in a wide variety of plastics (see FIG. WO 90/00967 A1). Frequently styrene-butadiene latex is used. It also has ready been suggestions einzusetzten VAE copolymer dispersions for these purposes. Examples can be found in GB 1,442,806 A, EP 0432391, EP 0 864 685 A1, US 5,084,503 A and US 5,124,394 A.
EP 1008689 A2 describes crosslinkable carpet back coating containing a VAE copolymer dispersion derived from 4 to 25 wt.% Of ethylene, 67 to 95 wt.% Vinyl acetate and 0.1 to 8 wt.% Of an ethylenically unsaturated hydroxy-functional monomer and a selected crosslinking agent. Having described dispersions are used which are stabilized by protective colloid / emulsifier. For details on the characteristics of the dispersions used, like ethylene content, glass transition temperature, or particle sizes of the VAE copolymers are not disclosed. WO 2006/0071157 A1 describes VAE copolymer dispersions suitable for coating carpets. VAE copolymer employed is set to be relatively soft and has a glass transition temperature in the range of 0 to -40X on. The ethylene content of these copolymers is correspondingly high. Sticking strength. However, the dimensional stability of the coated products is still in need of improvement. Polymer in a Vliestoffbindemittel for improving the wet strength of a moistened wipe. As binders% of a-linking monomers, inter alia, vinyl ester-ethylene copolymers are described which weight from 65-85.% Of a Vinylesters, 5-30 wt.% Of ethylene and optionally up to 12 wt. Derived. The dispersions are due to their ethylene content of more than 5 wt.% Adjusted relatively soft. These dispersions are unlikely to achieve the dimensional stability, as is common in carpets or belts. The dimensional stability of the thus-impregnated wipes is not improved, which is also not necessary in this indication. DE 10 2006 037 318 A1 discloses a process for the application of a dispersion adhesive by means of nozzle application. Preferably Vinylester-ethylene copolymers of vinyl esters%%% are used, the weight from 40-95., Up to 45 wt. Ethylene and up to 60 wt. Of further monomers copolymerizable therewith derived. The specifically disclosed in this document VAE copolymer dispersions have ethylene contents of well over 5 percent.% To. DE 102004 023 374 A1 describes preservative-free coating compositions comprising a selected Vinylester copolymer and a strongly basic agent to adjust a pH value of the dispersion to a value above 10. Described are copolymers derived from vinyl acetate, ethylene and versatic acids. The ethylene content of these copolymers is typically 15 to 20 wt.%. Mixture of polyvinyl alcohols used. The average particle diameter of the dispersions obtained are relatively coarse and are typically 0.8 to 1, 2 microns (d w). Copolymer emulsions stabilized with a polyethylene glycol-polyvinyl alcohol mix. The copolymers are derived from 50-95 wt.% Vinyl acetate and 5-30 wt.% Of ethylene and optionally up to 10 wt.% Further monomers copolymerizable therewith from. As stabilization system, a polyethylene glycol-polyvinyl alcohol mixture is used. Again, the average particle diameter of the dispersions obtained are likely to be relatively coarse typically in the range of well above 500 nm (d w). Ethylene and, optionally, small amounts of other copolymerizable monomers therewith. The polymerization takes place in the presence of a stabilizing system of emulsifier and protective colloid. Vinyl acetate, and emulsifier are added in portions during polymerization. 60 wt.%, Based on the total amount of the monomers used in the copolymerization. The proportion of vinyl acetate and of ethylene is 60-95 wt.% And 5-40 wt.%, Based on the total amount. The emulsion polymerization can be carried out in the presence of emulsifiers and / or protective colloids. In the selection of treatment agents for floor coverings on the one hand to a sufficiently high bending rigidity (dimensional stability) is important to ensure the film and formed from the binder-impregnated sheet; On the other hand, the film or the impregnated sheet material must not be too brittle to prevent breakage of the fabric in use. In the past, it has ( "Vac homopolymer dispersions") was added with the use of vinyl acetate homopolymer dispersions for this purpose usually plasticizer to adjust the required property profile. Previously used VAE copolymer bond the fibers good, but are too soft in order to achieve satisfactory dimensional stability. In addition, plasticizers tend to migrate and should therefore be avoided if possible. selected VAE copolymer now been found which are characterized in combination with a low brittleness by a good flexural rigidity, which do not require plasticizers or with only small amounts of plasticizers and which is excellent for use as a binder for textile sheet materials, particularly those which be used as belts as floor coverings or suitable. This VAE copolymer dispersions are also characterized by good dimensional stability and feel. Copolymer dispersions with the aforementioned properties. Derives wt 30th% further monomers copolymerizable therewith, wherein the copolymer has a glass transition temperature of +15 to +32 0 C, has an average particle diameter d w of 50 to 500 nm by weight and having at least first and 0-2 wt% of emulators % is stabilized to protective colloids., where in the case of stabilizer systems of emulsifiers and protective colloids, the quantity of emulsifier is at least twice as large, preferably at least three times as large as the amount of protective colloid. Protective colloids, in these combinations, the emulsifier is much to choose on the amount of protective colloid. The viscosity of the Vinylester-ethylene copolymer dispersions according to the invention is usually from 100 to 10,000 mPas, especially 200-6000 mPas and most preferably 400 to 4000 mPas. The viscosity is measured with a Brookfield viscometer at 25 0 C using spindle 5 at 20 revolutions per minute (rpm) for the purposes of this description. This viscosity data refer to dispersions having a solids content in the range of 40 to 70 wt .-%, based on the total mass of the dispersion. At a dilution, the viscosity decreases accordingly. Surprisingly, it was found that vinyl acetate-ethylene copolymer dispersions according to the invention particularly suitable as a binder and suitable as adhesives for textile fabrics and give a very good balance between dimensional stability and flexibility. It has been found that vinyl acetate-ethylene copolymers can be used awarded a comparatively small proportion of ethylene units and a high proportion of very fine polymer for this application. By the selective incorporation of a certain proportion of "soft" monomer ethylene, optionally in combination with further comonomers, such as acrylates, the processing and utility properties can control the VAE copolymers of the invention. The VAE copolymer according to the invention are prepared by free radical emulsion polymerization of at least vinyl acetate and at least ethylene and are mainly stabilized by emulsifiers. The monomer combination is chosen so that the Copolyrπereπ the VAE copolymer dispersions of this invention have glass transition temperatures in the range specified above. Heterogeneous systems such as core-shell or hemispheres may include a plurality of glass transition temperatures; in this case, at least one glass transition temperature ranges in the above-mentioned limits, while the glass transition temperature of the other phase can also move above these limits. Copolymers are formed having the above glass transition temperatures. In this case, polymers can be produced using homogeneous and heterogeneous morphologies. ( "Non-functional monomers"). These non-functional monomers can be used to adjust the glass transition temperature or the hydrophobic or hydrophilic properties of the VAE copolymer, for example. Wt.%, Preferably between 0 and 5.% Amount. The proportion of non-functional monomers in the VAE copolymer can be between 0 and 20 wt.%, Preferably between 0 and 10.%, Respectively, wherein the total amount of functional and non-functional monomers is not more than 30 wt.% By. Examples of functional monomers are ethylenically unsaturated acids, such as mono- or dicarboxylic acids, sulfonic acids or phosphonic acids. Instead of the free acids, their salts, preferably alkali metal or ammonium salts may be used. Examples thereof are acrylic acid, methacrylic acid, crotonic acid, maleic acid, fumaric acid, itaconic acid, vinylsulfonic acid, vinylphosphonic acid, styrene sulfonic acid, maleic or fumaric acid and Halbester of the itaconic acid with monovalent aliphatic saturated alcohols of chain length C I -C-IS as well as their alkali metal and ammonium salts or (meth) acrylate of sulfoalkanols, e.g. Further examples of functional monomers are ethylenically unsaturated monomers, the silane at least one amide, epoxy, hydroxyl, N-methylol, trialkoxy- or having carbonyl group. 2-ethylhexanoic, lauric, palmitic, myristic and stearic acid. Vinylester of Versatic, particularly VeoVa® 9, VeoVa® 10 and VeoVa® 11 are preferred. Ethylene are oderVinylaromaten. Examples include propylene, 1-butylene, 2-butylene, styrene or α-methylstyrene. Dicarboxylic acids. Preferably, these are esters of alcohols having one to eighteen carbon atoms. Examples of such non-functional monomers are methyl methacrylate or acrylate, butyl methacrylate or acrylate, 2-ethylhexyl methacrylate or acrylate, dibutyl maleate or dioctyl maleate. A particularly preferred vinyl acetate-ethylene copolymer derived from a vinyl acetate-ethylene copolymer obtained by emulsion polymerization of vinyl acetate and ethylene and optionally at least one other monomer copolymerizable therewith in the presence of at least one nonionic emulsifier and / or at least one anionic emulsifier, may be optionally up to 2 wt.%, based on Gesamthauptmonomer (= vinyl acetate, ethylene and, if used, non-functional monomer) of a molecularly or dispersely water-soluble polymer present. Alkylene oxide groups and / or anionic emulsifiers having sulfate, sulfonate, phosphate and / or phosphonate groups, which are optionally used in conjunction with molecularly or dispersely water-soluble polymer, preferably together with polyvinyl alcohol. Another preferred variant of the VAE dispersions of the invention comprises vinyl acetate-ethylene copolymers which additionally contain 0.5 to 20 parts by weight of esters of acrylic acid and / or esters of methacrylic acid and / or diesters of maleic acid with monohydric saturated alcohols, in particular butyl acrylate ( BuA) and / or, received 2 ethylhexyl acrylate (2-EHA) and / or dibutyl maleate and / or dioctyl maleate. The solids content of the VAE copolymer according to the invention is typically 40 to 70 wt .-%, preferably 45 to 60 wt.%, Based on the total weight of the dispersion, more preferably 48-55%. These dispersions can be diluted in use, wherein the viscosity changes accordingly. 50: 1. The VAE copolymer dispersion may additionally contain small amounts of polymeric stabilizers (protective colloids). Genapol.RTM, Lutensol® or Emulan® available. These include, for example, ethoxylated mono-, di- and tri-alkylphenols (EO units: 3 to 50, Alkylsubstituenten- rest: C 4 to C 12) and ethoxylated fatty alcohols (EO units: 3 to 80; alkyl radical: C 8 to C 3 6), especially Ci 2 -C 4 fatty alcohol ethoxylates (3-40), C 3 -C 5 oxo alcohol ethoxylates (3-40), C 6 C 18 fatty alcohol (11-80) ethoxylates, Cio-oxo (3 -40) ethoxylates, C 13 oxo alcohol (3-40) ethoxylates, polyoxyethylene groups of 20 ethylene oxide, copolymers of ethylene oxide and propylene oxide having a minimum content of 10 wt .-% ethylene oxide, the polyethylene oxide (4-40) ethers of oleyl alcohol and polyethene oxide (4-40) ethers of nonylphenol. Particularly suitable are the polyethylene oxide (4-40) ethers of fatty alcohols, in particular oleyl alcohol, stearyl alcohol or Cn alkyl alcohols. 1 to 8 are nonionic emulsifiers E1 typically wt.%, Preferably 1 to 5.%, Particularly preferably from 1 to 4.%, Based on the Gesamthauptmonomermenge used. It is possible to use mixtures of nonionic emulsifiers. Succinic acid, or phosphates of polyethoxylated alkanols or alkylphenols. Emulsifiers are used particularly preferably not containing alkyl phenyl ethoxylates. 0.1 to 3 are of anionic emulsifiers E2 typically wt.%, Preferably 0.1 to 2 wt.%, Particularly preferably 0.5 to 1.5 wt.%, Based on the Gesamthauptmonomermenge used. It can also be used mixtures of anionic emulsifiers. It can also be used mixtures of nonionic and anionic emulsifiers. The weight proportion of emulsifiers E1 to E2 can vary within wide limits, for example between 50: 1 and 1: 1. In addition to the employed during the emulsion polymerization emulsifiers and optionally protective colloids VAE copolymer according to the invention may further comprise subsequently added water-soluble or water-dispersible polymers and / or subsequently added emulsifiers. Typically, the total amount of emulsifiers, based on the total amount, 1 to 8 wt.%, Preferably 1 to 6.%, Particularly preferably 1 to 4 wt.%. Besides inventive emulsifiers Vinylester-ethylene copolymer dispersions the protective colloids, preferably polyvinyl alcohols and / or their modifications can contain. Protective colloids - if present - are generally present only in relatively low concentrations, for example in up to 2 wt%, based on the total amount of the main monomers used.. Preferably, the Vinylesterpolymerdispersionen used in the invention contain no or up to 1 wt.%, Based on the total amount of the main monomers used, of protective colloids. The protective colloids are water-soluble or water-dispersible polymers which are present during the emulsion polymerization and stabilize the resulting dispersion. Emulsifiers are low molecular weight compounds which stabilize the emulsion, and the resulting product. Examples of protective colloids are water-soluble or water-dispersible polymeric modified natural substances, such as cellulose ethers, for example methyl, ethyl, hydroxyethyl or Carboxymethylcellυlose; water-soluble or water-dispersible polymeric synthetic substances such as polyvinyl pyrrolidone or polyvinyl alcohols or their copolymers of etherified (with or without residual acetyl content), partly esterified or acetalized with saturated radicals or polyvinyl alcohol. The protective colloids can be used individually or in combination. In the case of combinations, each differing in their molecular weights or they differ in their molecular weights and chemical composition such as the degree of hydrolysis. Polyvinyl alcohols are preferably used; this may have been modified hydrophilically or hydrophobically in any way. Optionally, the erfindυngsgemäßen VAE copolymer may contain other for the formulation of binders or adhesives customary per se. contain additives. Chalk or calcium carbonate, pigments such as carbon black, and other additives and auxiliaries such as are customary for the formulation of binders or adhesives. The proportion of these additives in the inventive VAE dispersions can vary within wide limits and is selected by the skilled artisan in view of the desired field of application. When used as coating materials for floor coverings such as more may be known in this field latexes, such as SBR dispersions are combined with the inventive dispersion. The proportion of these additional dispersions can be up to 30 wt.% Amount. Furthermore, it is emphasized that the dispersion of the invention can be formulated with a high filler or pigment content. So% can be typically up to 80 wt. At these solids in the dispersion contribute. Usually not included, although the presence of small amounts is not excluded. Preferred according to the invention VAE copolymer are characterized by a very low content of VOC from, in particular VOC contents less than 1000 ppm, more preferably less than 500 ppm, based on the total mass of the dispersion. By VOC organic substances are to be understood in the context of this description, which have a boiling point of less than 25O 0 C and having no acid function. The VAE copolymer dispersions of the invention are prepared by free radical emulsion polymerization of the monomers in the presence of at least one emulsifier. Examples are enumerated above. Expert therefore known [cp. for example, Encyclopedia of Polymer Science and Engineering, Vol. 8, pp 659 et seq (1987)]. The emulsion polymerization can be carried out for example as batch procedures, with the total amount of monomers at the start of the polymerization; alternatively, a feed process can be used in which the addition of the monomers during the polymerization is carried out by continuous feed; but it can also be a part of the monomers, for example up to 50 wt.%, preferably up to 25 wt.%, are introduced at the start, and the rest will be supplied during the polymerization. The process performed with continuous inflow and up to 25% initial monomer process is particularly simple and can be performed in a short polymerization time, for example in times of 1 to 4 hours. The polymerization can also be carried out in known manner in multiple stages with different monomer combinations or in different pressure stages, with polymer dispersions having particles heterogeneous morphology. The polymerization of the ethylenically unsaturated monomers takes place in the presence of at least one initiator for the radical polymerization of the ethylenically unsaturated monomers. Suitable initiators for the free-radical polymerization, for initiating and continuing the polymerization during the preparation of the dispersions are all known initiators which are capable of a free-radical aqueous poly- merisation to start in heterophase systems. They may be Peroxodisulfate peroxides, such as alkali metal and / or ammonium or azo compounds, especially water-soluble azo compounds, act. Ascorbic acid or with reducing sugars. The amount of initiators used in the process, or combinations of initiators is within the bounds of customary for aqueous polymerizations in heterophase systems. In general, the amount of the initiator used is 5 wt.%, Based on the total amount of monomers to be polymerized, not exceed. Preferably, the amount of the initiators used, based on the total amount of monomers to be polymerized, from 0.05 to 2.0 wt.%. The total amount of initiator can be introduced at the beginning of the polymerization, or a portion of the initiator is preferably introduced at the beginning and the remainder is added after starting the polymerization in one or more steps or continuously. The addition may take place separately or together with other components, such as emulsifiers or monomer emulsions. It is also possible to start the emulsion polymerization using a seed latex by weight, for example, upon production of 0.5 to 15.% Of a dispersion. Substances are set. These so-called regulators are generally used in an amount of up to 2.%, Based on the monomers to be polymerized, is used. As regulators all substances known to the expert can be used. as organic thio compounds, silanes, allyl alcohols, and aldehydes are preferred. The polymerization temperature is generally 20 to 150 0 C and preferably 50 to 120 0 C.
Steam distillation) or by stripping with an inert gas. Further, the reduction of the residual monomers can also be chemically initiator systems by free-radical postpolymerization, in particular by the action of redox, as described for example in DE-A-4,435,423, take place. Preferably a postpolymerization with a redox initiator is at least one organic peroxide and one organic and / or inorganic sulfite and / or sulfinic acid derivatives. Particularly preferred is a combination of physical and chemical methods, wherein, the further lowering of the residual monomer by means of physical methods to preferably <2000 ppm, particularly preferably <1000 ppm, in particular <100 ppm, after a lowering of the residual monomer content by chemical postpolymerization. The polymerization is usually carried out at a pH in the range of less than / equal. 9 To adjust the pH of the VAE copolymer dispersion can in principle buffer systems, such as sodium acetate or phosphate buffer systems may be used. The VAE copolymer dispersion according to the invention can be preferably used as binders for textile fabrics, in particular as binders for carpets, carpet tiles, or straps, or for bonding verschiedenster layers of textile fabrics, especially carpets, carpet tiles or belts are running. It has been found that the dispersions used in this invention have good compatibility with pigments and fillers. The invention further relates to a textile fabric, which is treated with the above-described VAE copolymer dispersion. Extreme cases, all the intermediate forms are possible. The invention therefore preferably relates to a composite nonwoven fabric comprising a textile fabric coated with the above-described Vinylester-ethylene copolymer dispersion and partly impregnated and which is connected on the coated side so that at least one further backing layer. The VAE dispersions can be used advantageously in the production of woven carpets or tufted carpets. In this technique, the emulsion is applied in neat or in diluted form to the back of a fabric or tufted fabric. After drying, the polymer gives the carpet an excellent tuft bind, dimensional stability and improved properties location. The invention therefore preferably relates to a textile fabric in the form of a Webteppichs or a tufted carpet, which is coated on the side facing away from the tread side to the side described above VAE dispersion and partially impregnated. In this variant are preferably textile fabrics having a basis weight of 1000 to 3000 g / m 2, preferably employed from 1200 to 2500 g / m 2. The VAE dispersions can also be used for bonding a secondary backing of carpets. For this purpose, the emulsion is applied to the secondary backing and then combined with the textile surface forming the tread surface. Dispersion completely impregnated. After drying, a product with very good durability, dimensional stability and feel. The invention also preferably relates to a textile fabric in the form of a carpet, in which a textile sheet is impregnated on the base of a heavy nonwovens with the above VAE dispersion. In this variant, preferably Nonwovens are used having a basis weight of 200 to 600 g / m 2, preferably from 250 to 500 g / m 2.
to secure loads on trucks during transport. The invention also preferably relates to a textile fabric in the form of a belt, in which a textile surface with the above VAE dispersion is impregnated, preferably containing a filler and / or pigments VAE dispersion. In this variant, preferably textile fabric having a basis weight of 500 to 3000 g / m 2, preferably employed from 1000 to 2000 g / m 2. The textile fabrics to a wide variety of types can be used. Examples include non-woven fabrics, woven, laid or knitted fabric. Advantageously, also pile fabrics can be used; these are coated on the side remote from the pile side with the invention VAE copolymer dispersion and in part impregnated. In particular tufted pile fabrics are used; these may have open and / or closed loops. One type of modern Fυssbodenbeläge is made from a base fabric and an associated pile. The pile is connected to the base fabric and covers it on the tread side. On the side remote from the pile side, these textile fabrics are provided with a backing layer. This serves on the one hand, the fixing of the pile in the backing fabric and on the other hand determines the walking comfort significantly. Textile carpets of procedure beschreibenen type are generally referred to in the trade as "carpet" with such carpeting is sold both as broadloom and in the form of carpet tiles and laid. Textile carpets can be woven, tufted or produced by the needle felting. The Web - and tufted Tepichen a distinction structures with closed loops, eg boucle rugs, or constructions with cut tufts, eg velor carpets the tufted carpets, textile fiber, usually polyamide, after tufting according to the sewing machine principle in the final. base fabric used. the base fabric ensures a dimensional stability and the pile for the appearance and some rode least comfort. The above-mentioned nonwoven fabrics are provided in addition in a known manner reverse with layers of flexible plastic. One of these layers, known as primary backing layer is primarily used to fix the incorporated in the backing fabric textile fibers or the fixing of the fabric. Binders were used on the basis of VAE copolymer dispersions in the past for this purpose. A further plastic layer, called secondary backing layer, for example of natural rubber, styrene-butadiene latexes, polyvinyl chloride or Polyurehanen is thick generally between 2 and 8 mm, and contributes significantly to the walking comfort because of their elastomeric properties at. The aforementioned secondary backing layer is foamed in the rule, and then provides a so-called foam backing. Beside the walking comfort already mentioned the foam backing also provides temperature and sound insulation and besizt also generally a relatively good life. The secondary backing layer is generally associated with the fabric by lamination. For this purpose, can for example be a direct connection to the primary backing layer, or it may be an adhesive layer between the primary and secondary backing are attached. The secondary backing layer available materials can be used. Examples are foam or compact foam-backed or non-woven fabrics, which are optionally connected to werteren textile fabrics, such as woven or knitted fabric or meshed, whereby the backing layer in a longitudinal or longitudinal and transverse direction is enhanced. The secondary backing layer is equipped electrostatically conductive as needed, and can be designed accordingly in textile feel and look. In order to obtain a sufficient walking comfort depending on the installation situation, secondary backing layers are normally used having a basis weight of 100 to 900 g / m 2 and a thickness of 0.5 to 10 mm. To the inventive textile fabric may be modified in multiple conventional manner and adapted to the desired use. As carpets are equip antistatic typically by being mixed with conductive fibers, which cause a reduction in the surface resistance. The textile surface according to the invention can in principle be manufactured in various ways. The person skilled in the methods of production of textile fabrics are known. In general, all types of fibers and fiber blends can be used. If, for example based on the conventional production of staple fiber nonwovens, it will be in the process stages "open - solidifying mixing - fine opening - - web formation" converted into a tradable commodity. Furthermore, both an un-hardened as well as a solidified non-woven fabric can be used for the production of the textile surface according to the invention. An unmistakable unfortified nonwoven fabric may be by means of a bonding process, such. B. be solidified by the so-called Mali Watt method. It is also possible to process a pre-bonded nonwoven fabric, the z. B. was solidified by mechanical, chemical or thermal process steps. As nonwoven fabrics, so-called filament webs are suitable in addition to the staple fiber webs that are subdivided into formed by deposited filaments (continuous fibers) non-woven fabrics, so-called spunbonds, or nonwoven fabrics formed by deposited fibers by the melt-blown principle. Again, the solidification of nonwoven fabrics can be prepared by the previously described methods. Nonwoven fabric can be made. The nonwoven fabric may also be connected with another fabric, for example a woven or knitted fabric made of filament yarn or spun yarn. Under filament yarn is meant a yarn composed of multiple filaments, with or without rotation, whereby the continuous filaments may also have a textured form. In the latter case, in a texturing process. the otherwise smooth filament yarn awarded a textile appearance by imparting a high ball to the filament. Here, too, both polyolefins and polyamides or polyester can be used as raw materials. The invention also relates to the use of the VAE copolymer dispersion described above for the treatment of textile fabrics, particularly those which are used in the manufacture of floor coverings or belts. In these applications, a asugezeichnete dimensional stability is required. The following examples illustrate the invention without limiting it. Spectra Physics with a laser power of 2 W and a wavelength of 532 nm. The detector used is a bialkali photocathode type 4517 of the firm Burle (formerly RCA) is used. The scattered radiation of the above spray dried particulate has been detected at an angle of 40 °. The signal evaluation takes place with a multichannel company TMCA with 1024 channels. As sample preparation, 0.2 ml of the test sample in 100 ml of ultrapure water were diluted with a conductivity of 18.2 .mu.S / m. The sample was sprayed over a Beckmann nozzle and dried with nitrogen. The resulting individual particles with beta radiation (Kr-85) neutralized and then tested on the single particle light scattering experiment. As a result, the number and mass of the distribution in the range of 80 nm to 550 nm and were calculated as mean values d n, d w, z and d output d w / d n.
The measurement of the glass transition temperature was performed with a Mettler DSC 820 at 10 K / min. The second heating curve was evaluated. The samples were wt% by saturation of Whatman paper no. 1 up to an addition amount of 20. Manufactured of emulsion. The samples were conditioned prior to the experiment for 24 hours at 23 0 C and at 50% relative humidity. 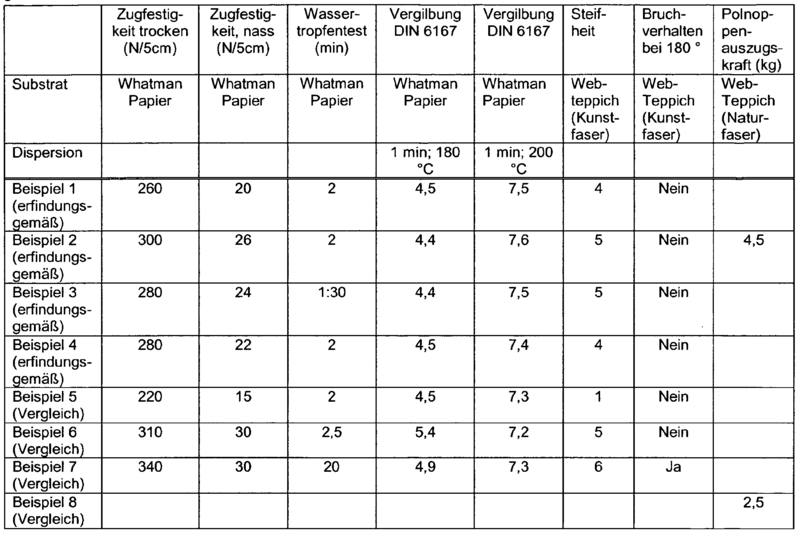 Whatman paper is commonly used in comparative tests for Polymerfilman- turns in carpets, as it represents a very uniform substrate. It can be assumed that the results obtained represent an indicator of performance in carpet applications. The strength test was performed on a Lloyd LR100K device using a 100 kN load cell. The following test settings were used: tensile speed: 100 mm per minute; 50 mm wide sample piece; Spacing of the clamping jaws: 200 mm. The sample was stretched until fracture, and it was the force in N per 50 mm recorded. The results were presented as mean values ​​of four measurements with the same substrate. To determine the tensile strength at a wet sample, the test was carried out as described above with the modification that the sample was immersed for one hour in deionized water prior to the experiment. The samples were wt% by saturation of Whatman paper no. 1 up to an addition amount of 20. Manufactured of emulsion. The samples were conditioned prior to the experiment for 24 hours at 23 ° C and at 50% relative humidity. The sample was exposed in a Mathis Lab Dryer for the desired period of time (eg 1 minute) of the desired temperature (180 0 C and 200 0 C) and the degree of yellowing was determined with a Minolta spectrophotometer CM3600d. The results were given in the form of yellowness index to DIN 6167th The higher the observed number was, the stronger was the yellowing of the sample. The binder dispersion was diluted to 25% solids and applied to a woven carpet (Axminstertyp on the basis of polyester / polyamide; basis weight untreated: 1600 g / m 2). The application rate was 100 g / m 2 solids. The 20 cm x 20 cm x 1 cm sample pieces were dried in a Mathis Lab Dry device at 110 0 C for 8 minutes and the fracture behavior was manually determined by the sense of hearing. The fracture behavior was characterized by "yes" or "no." Weight is measured, in which a loop of the textile floor covering dissolves. The result is measured in kg and indicated. The test is repeated five times and averaged. The error of the measurement is approximately 20%. Example 1: Preparation of a erfindυngsgemäßen Polvmerdispersion - 4 wt% ethylene. This example describes the preparation of a dispersion of 4 wt .-% of ethylene, based on the amount of main monomer (= ethylene vinyl acetate +). The polyvinyl alcohol was ever before dissolved in a 15% solution at 90 0 C for 2 hours. The apparatus was freed from atmospheric oxygen. 5% of the vinyl acetate quantity (total amount: 12269 g) was metered into the reactor. The ethylene valve was opened, and 6.8% of ethylene (total amount 314 g) pressed at about 10 bar. At the same time, the temperature was raised to 65 0 C. At 55 0 C, the initiator was added quickly dosed 1 (28 g of sodium peroxodisulfate in 223 g E-water). When the 65 0 C was reached, the residual vinyl acetate was metered in in 210 minutes and the ethylene valve open until the entire amount of ethylene in the reactor. The pressure remains at max. about 15 bar. After 180 minutes, the vinyl acetate, an initiator solution was metered 2 (13 g of sodium peroxodisulfate in 223 g E-water). After the end of the vinyl acetate, the mixture over 50 minutes was heated to 85 0 C and held for 1 hour at this temperature. The mixture was cooled. a redox treatment was subsequently (t-butyl hydroperoxide / Bruggolite FF6) and / or a physical treatment performed to reduce the residual monomers. Example 2: Preparation of a polymer dispersion of the invention - weight 2.5. It was worked as in example 1 with the difference that only 2.5 wt .-% ethylene respect. Main monomer (= ethylene vinyl acetate +) were used. The proportion of vinyl acetate was increased accordingly. Example 3: Preparation of a polymer dispersion according to the invention - 2.5 wt% of ethylene, without protective colloid. It was worked as in example 1 with the difference that only 2.5 wt .-% ethylene respect. Main monomer (= ethylene vinyl acetate +) was used and that no polyvinyl alcohol was used. The proportion of vinyl acetate was increased accordingly. In a printing apparatus as in Example 1, the following dispersion was prepared. A procedure with short polymerization was used. The polyvinyl alcohol was previously dissolved in a 15% solution at 90 0 C for 2 hours. Dosing of initiator 2 for about 30 minutes after. This was followed by another hour reheated at 85 0 C in order to reduce the residual monomer content. Vinyl acetate was reduced accordingly. Mowilith ® DC is a commercial product from Celanese Emulsions GmbH. The control latex is a typical SBR latex for carpet Rückenbeschichtυngen with 59 wt .-% styrene monomer units. The latex was prepared by emulsion is stabilized anionsch and has a solids content of 50 wt .-% and a particle size between 150 and 300 nm. Dispersion This example illustrates the present invention (Nos. 2, Table 1) shows a significantly higher and thus improved Polnoppenauszugskraft than the comparative example (no. 8, Table 1).. The ethylene content of the dispersions used in the inventive VAE copolymer causes an internal plasticizer effect. This roughly corresponds to the behavior of an SBR latex. Compared to SBR latex used in the invention, the VAE copolymer dispersion on a number of advantages. This is an improved flame resistance; thus formulations less content can be used in flame retardants. Also creates less smoke when burning an inventive back-coated fabric product. In addition, the VAE copolymer dispersion is odorless, can with a low content of volatile organic compounds ( "VOC") are formulated or even without VOC, the back-coated textile product gives an exceptionally good resistance to aging. Vinyl acetate homopolymer dispersions require external plasticizer in the rule. This can migrate during use. The Texilprodukte invention do not require plasticizers. Glass transition temperatures below 15 0 C or VA homopolymer dispersions can be seen in the combination of increased rigidity with improved fracture behavior and in a good dimensional stability. As another advantage, the simple emulsion formulation can be seen; The dispersion can be prepared by methods with short process durations (for example, methods durations of 3 to 5 hours, calculated from the reactor to reactor vacancy vacancy). Particle diameter d w has from 50 to 500 nm and is present with at least 1.% Of emulsifiers and 0-2 wt.% Is stabilized in protective colloids, wherein in the case of stabilizer systems of emulsifiers and protective colloids, the amount of emulsifier is at least twice as large as the amount of protective colloid. 2. vinyl acetate-ethylene copolymer according to claim 1, characterized in that the Vinylester-ethylene copolymer is up to 30 wt.% Is derived other monomers copolymerizable with vinyl acetate and ethylene monomers. 3. vinyl acetate-ethylene copolymer dispersion according to any one of claims 1 to 2, characterized in that the viscosity of 400-4000 mPas, measured at 25 ° C with the Brookfield viscometer. Ethylene content of 1 to 3 wt.% By weight. 5. vinyl acetate-ethylene copolymer dispersion according to any one of claims 1 to 4, characterized in that the glass transition temperature of the vinyl acetate-ethylene copolymers is between +20 and +30 0 C.
6. vinyl acetate-ethylene copolymer dispersion according to any one of claims 1 to 5, characterized in that it was obtained as another by polymerization in the absence of a protective colloid. 7. vinyl acetate-ethylene copolymer according to claim 2, characterized in that the other monomers copolymerizable with vinyl acetate and ethylene monomers are selected from the group consisting of ethylenically unsaturated acids, or salts thereof, the ethylenically unsaturated monomers containing at least one amide, epoxy , hydroxy, N-methylol, have trialkoxysilane or carbonyl group, or combinations of two or more monomers from this group. 8. vinyl acetate-ethylene copolymer according to claim 2, characterized in that the other monomers copolymerizable with vinyl acetate and ethylene monomers are selected from the group of Vinylester that are not vinyl acetate, the alpha-olefins other than ethylene, vinylaromatic compounds, esters of ethylenically unsaturated monocarboxylic acids or diesters of ethylenically unsaturated dicarboxylic acids. 9. vinyl acetate-ethylene copolymer dispersion according to any one of claims 1 to 8, characterized in that the emulsifiers do not contain alkyl phenyl ethoxylates. 10. A textile fabric treated with a vinyl acetate-ethylene copolymer dispersion according to any one of claims 1 to 9. 11. A textile fabric according to claim 10, characterized in that this one is in the form in the form of a Webteppichs or a tufted carpet, which is coated on the side facing away from the tread side to the side Vinylester-ethylene copolymer and in part impregnated. 12. A textile fabric according to claim 11, characterized in that the textile fabric has a basis weight of 1000 to 3000 g / m 2. 13. A fabric according to claim 10, characterized in that it is in the form of a carpet, which is glued on the side facing away from the tread side side with a secondary backing coating, wherein the adhesion between the two layers is carried out by the Vinylester-ethylene copolymer dispersion. 14. A fabric according to claim 10, characterized in that it is in the form of a in form of a carpet, in which a textile sheet on the basis of a heavy nonwovens impregnated with the Vinylester-ethylene copolymer dispersion. 15. A textile fabric according to claim 14, characterized in that the nonwoven has a basis weight of 200 to 600 g / m 2. 16. A fabric according to claim 10, characterized in that it is in the form of a in form of a belt, in which a textile sheet is impregnated with the vinyl acetate-ethylene copolymer. 17. A textile fabric according to claim 16, characterized in that the textile fabric has a basis weight of 500 to 3000 g / m 2. 18. A fabric according to any one of claims 10 to 17, characterized in that it comprises at least one textile surface, which is selected from the group nonwoven fabrics, scrims, knitted fabrics and pile fabrics. 19. A fabric according to claim 18, characterized in that the pile fabric is on the side remote from the pile side coated with the vinyl acetate-ethylene copolymer dispersion and in part impregnated. Claims 1 to 9 for impregnating and / or coating of textile fabrics. 21. Use according to claim 21, characterized in that the textile fabrics are used in the manufacture of floor coverings or belts. MX2011008353A MX2011008353A (en) 2009-02-09 2010-02-06 Vinyl acetate-ethylene-copolymer dispersions and textile web material treated therewith.